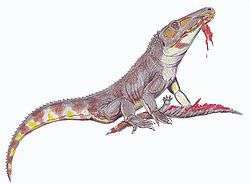 Proterosuchidae is an early, possibly paraphyletic, assemblage of basal archosauriformes whose fossils are known from the Latest Permian and the Early Triassic of Europe, Asia, Africa, Australia and possibly South America. The name comes from Greek πρότερο- ("first") and σοῦχος ("crocodile"). They were slender, medium-sized (about 1.5 meters long), long-snouted and superficially crocodile-like animals, although they lacked the armoured scutes of true crocodiles, and their skeletal features are much more primitive. The limbs are short and indicate a sprawling posture, like contemporary lizards but unlike most later archosaurs. Their most characteristic feature is a distinct down-turning of the premaxilla (the front of the upper jaw, which overhangs the lower jaw). The terminal Permian catastrophe, which killed off 95% of all types of life, cleared the world of all large therapsids and allowed the proterosuchids to take center stage as the top carnivore. Within the space of five million years the proterosuchids had evolved into a wide variety of terrestrial and semi-aquatic carnivores. The proterosuchids represent perhaps the earliest adaptive radiation of the archosaurs. They gave rise to the Erythrosuchidae some time in the Early Triassic. Recent studies consider Proterosuchidae to be at least a partially paraphyletic grouping, meaning that it does not form a true clade with a single common ancestor and proterosuchids as its only descendants. Instead, they are a chain of successively basal archosauriforms. Below is a cladogram from Ezcurra (2016), that reexamined all historical members of the "Proterosuchia" (a polyphyletic historical group including proterosuchids and erythrosuchids). The placement of fragmentary taxa that had to be removed to increase tree resolution are indicated by dashed lines (in the most derived position that they can be confidently assigned to). Taxa that are nomina dubia are indicated by the note "dubium". Bold terminal taxa are collapsed. Ezcurra (2016) recovered a monophyletic Proterosuchidae containing only Archosaurus and the species of Proterosuchus, however some species (e.g. Chasmatosuchus spp, Vonhuenia friedrichi) are too fragmentary to resolve whether they also fall into Proterosuchidae. Tasmaniosaurus, Fugusuchus, Sarmatosuchus, Cuyosuchus and the "Long Reef proterosuchid" (SAM P41754) on the other hand were recovered confidently outside of Proterosuchidae. ↑ "Archosauria: Archosauriformes". Palaeos. Retrieved 29 October 2014. ↑ Ezcurra, M.D. ; Lecuona, A.; Martinelli, A. (2010). "A new basal archosauriform diapsid from the Lower Triassic of Argentina". Journal of Vertebrate Paleontology. 30 (5): 1433–1450. doi:10.1080/02724634.2010.501446.